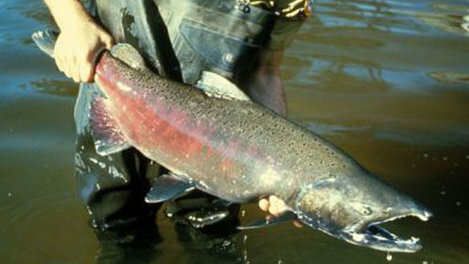 Below is quick update on the upper Salmon River chinook fishery. As addressed in my last update, the fishery below Valley Creek (downstream to Challis) closed on Sunday 7/2 at 10:00pm. The river above Valley Creek upstream to the posted boundary at Sawtooth Hatchery remains open. Over the weekend, we saw a limited amount of effort in the fishery, and again documented no harvest. River conditions still remain higher than normal, but flows continue to slowly drop (see graph below). It is very likely that we will see much higher than average flows for the duration of the upper Salmon River Chinook fishery. Although flows remain high, the river is clearing and is fishable in the open section. Our current estimate of Sawtooth Hatchery Chinook over Bonneville Dam is 2,560 fish, which bumped up a little from last week as we saw another PIT tagged fish cross Bonneville Dam on 7/3. Over half of those fish (1,544) are now over Lower Granite Dam. 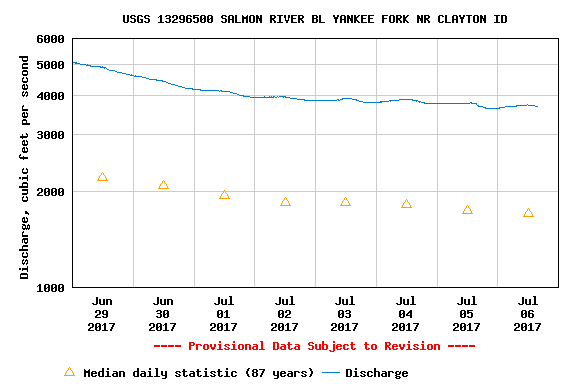 Conversion between dams of Sawtooth adult Chinook migrating through the Columbia and lower Snake remains a bit below average (65% vs. 83%). Based on that, our harvest share should land between 300 and 400 fish. Sawtooth hatchery has trapped 4 fish this week – one on 7/3, one on 7/4, and two today (7/6), so the fish are starting to trickle in. With fish starting to show up and the river getting in better shape by the day, the Chinook fishing in the upper Salmon should pick up soon – good luck to all of those that are able to get out there this weekend!